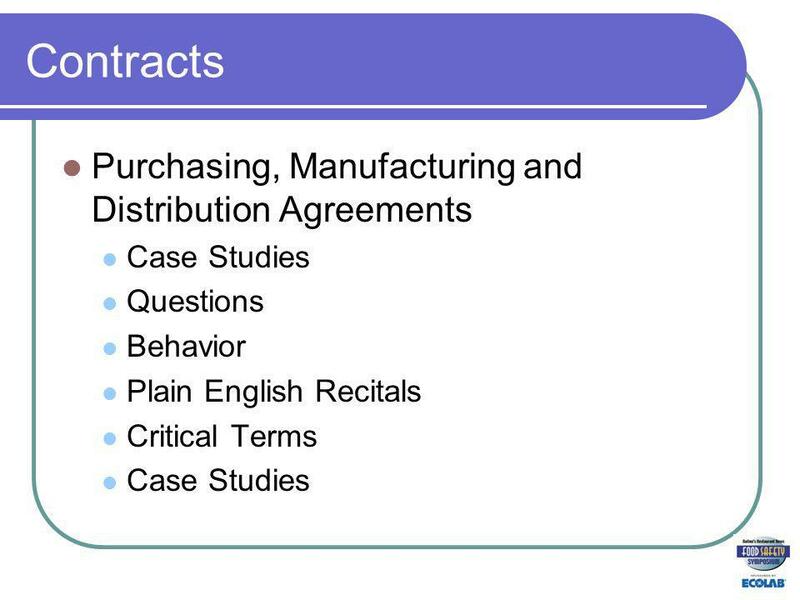 Contracts Purchasing, Manufacturing and Distribution Agreements Case Studies Questions Behavior Plain English Recitals Critical Terms Case Studies. 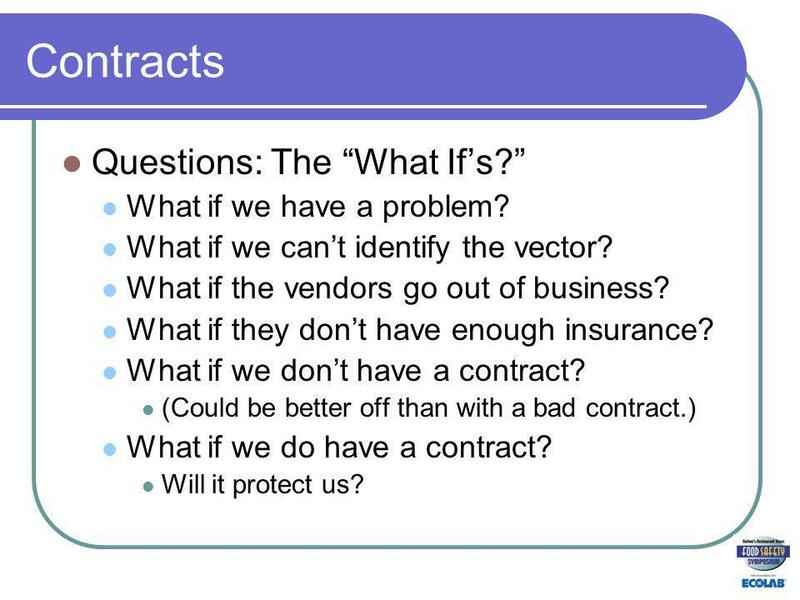 3 Contracts Questions: The What Ifs? What if we have a problem? What if we cant identify the vector? What if the vendors go out of business? What if they dont have enough insurance? What if we dont have a contract? (Could be better off than with a bad contract.) What if we do have a contract? Will it protect us? 4 Contracts Case Study No. 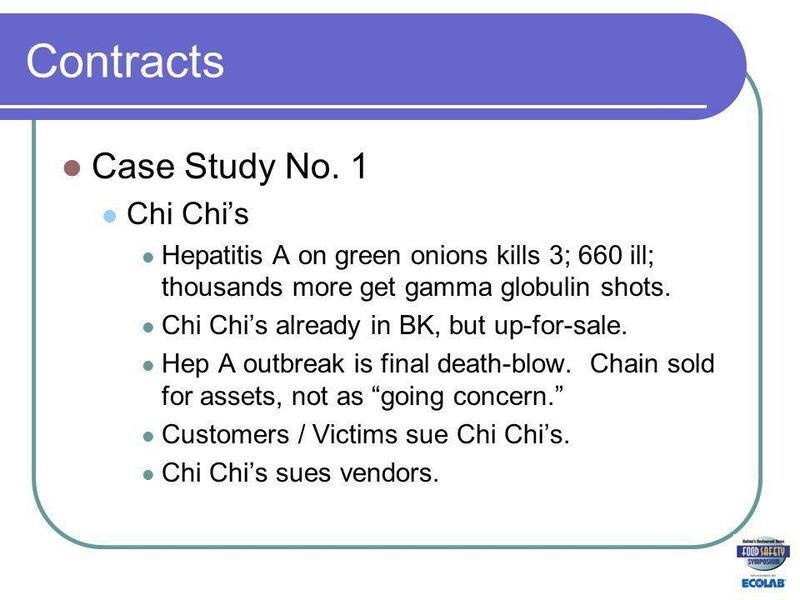 1 Chi Chis Hepatitis A on green onions kills 3; 660 ill; thousands more get gamma globulin shots. Chi Chis already in BK, but up-for-sale. Hep A outbreak is final death-blow. Chain sold for assets, not as going concern. Customers / Victims sue Chi Chis. Chi Chis sues vendors. 5 Case Study No. 1 Chi Chis (cont.) 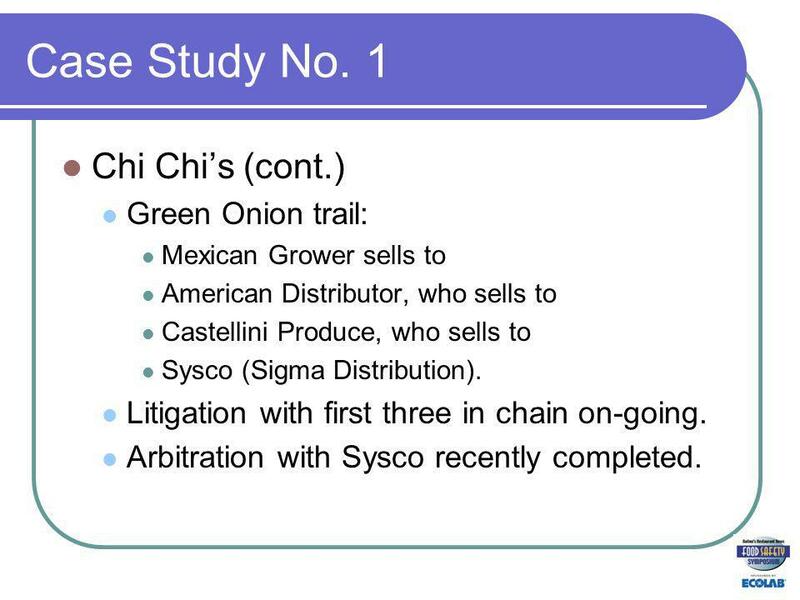 Green Onion trail: Mexican Grower sells to American Distributor, who sells to Castellini Produce, who sells to Sysco (Sigma Distribution). Litigation with first three in chain on-going. Arbitration with Sysco recently completed. 6 Case Study No. 1 Chi Chis (cont.) Chi Chis and Sysco had a contract. Clauses included Indemnification and limitations on liability and remedies. Sysco argued that an express provision limited remedies. 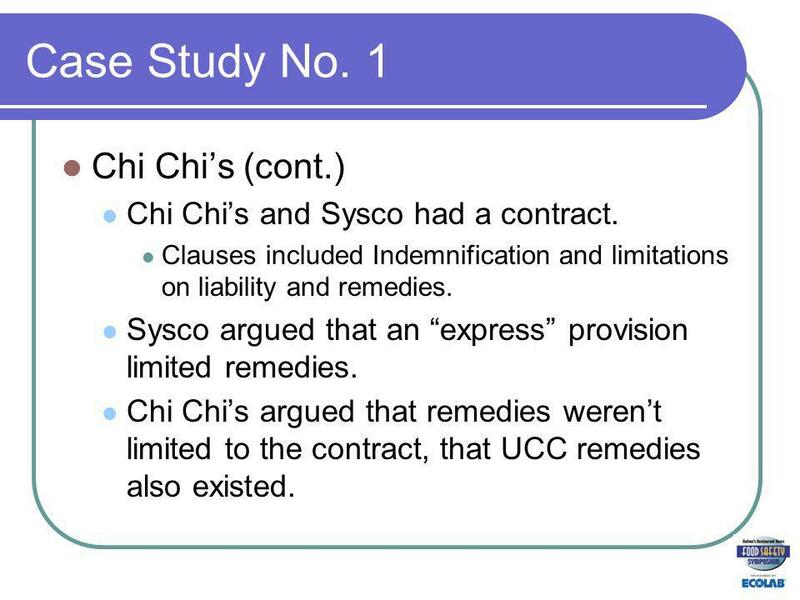 Chi Chis argued that remedies werent limited to the contract, that UCC remedies also existed. 7 Case Study No. 1 Chi Chis (cont.) Why does it matter? 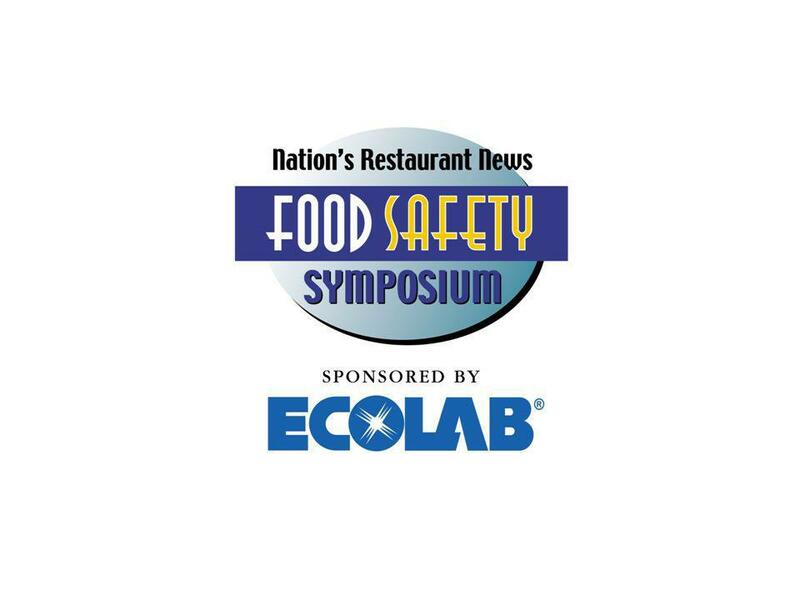 Sysco argued that they had to be grossly negligent to be liable. 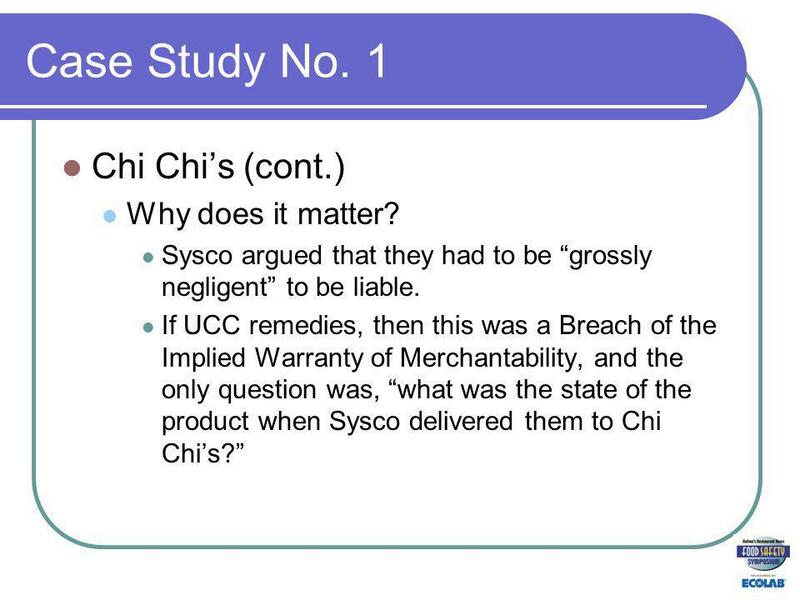 If UCC remedies, then this was a Breach of the Implied Warranty of Merchantability, and the only question was, what was the state of the product when Sysco delivered them to Chi Chis? 8 Case Study No. 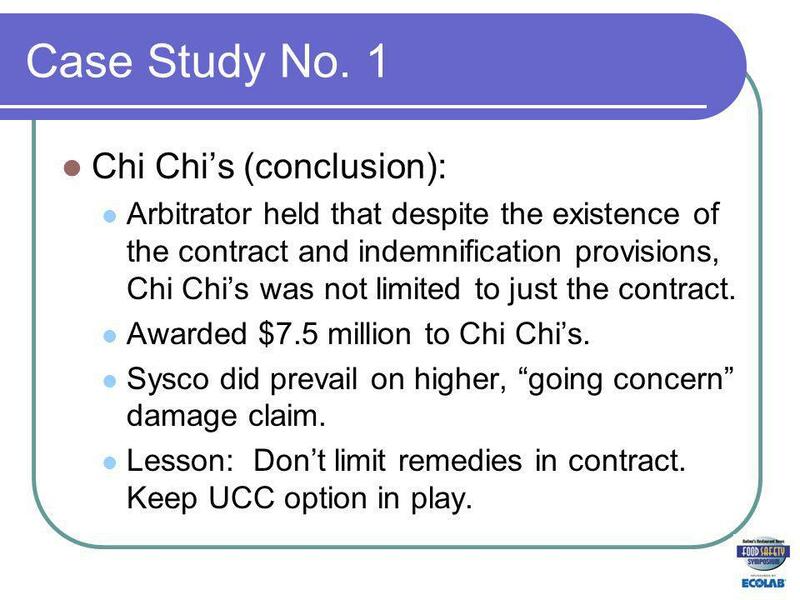 1 Chi Chis (conclusion): Arbitrator held that despite the existence of the contract and indemnification provisions, Chi Chis was not limited to just the contract. Awarded $7.5 million to Chi Chis. Sysco did prevail on higher, going concern damage claim. Lesson: Dont limit remedies in contract. Keep UCC option in play. 9 Case Study No. 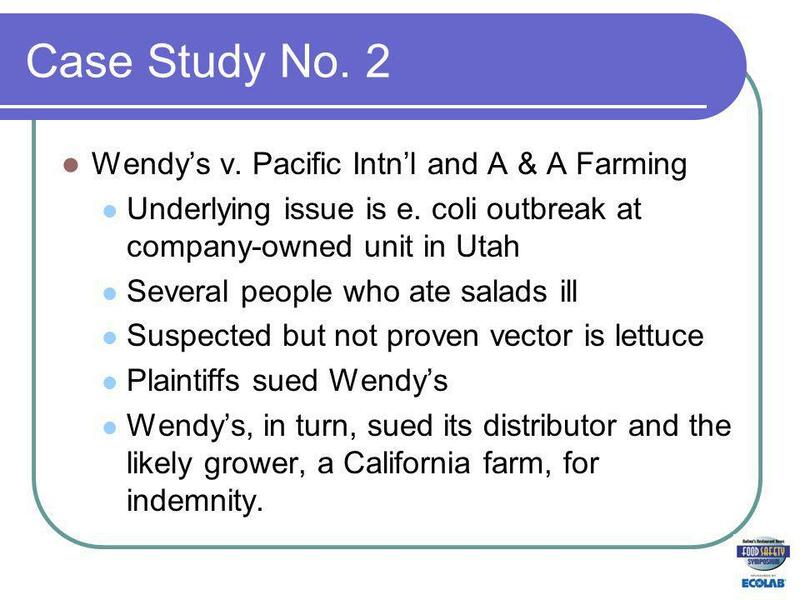 2 Wendys v. Pacific Intnl and A & A Farming Underlying issue is e. coli outbreak at company-owned unit in Utah Several people who ate salads ill Suspected but not proven vector is lettuce Plaintiffs sued Wendys Wendys, in turn, sued its distributor and the likely grower, a California farm, for indemnity. 10 Case Study No. 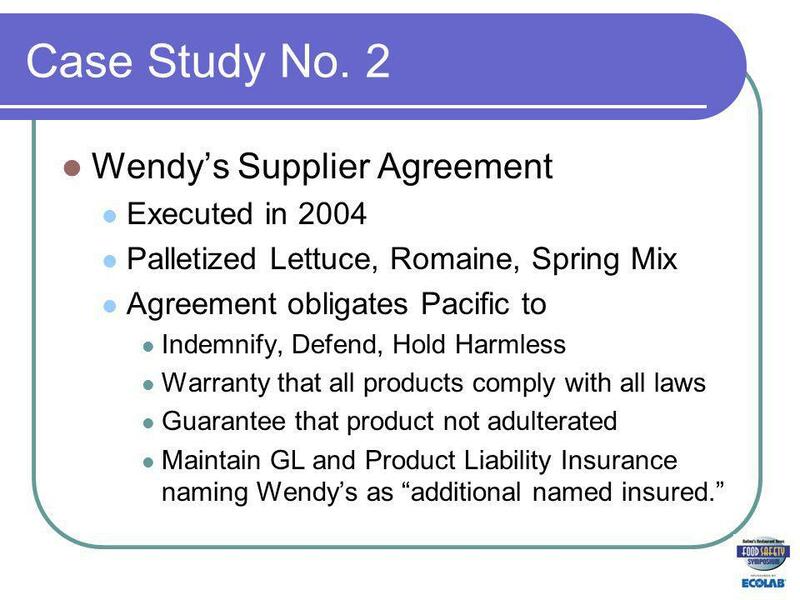 2 Wendys Supplier Agreement Executed in 2004 Palletized Lettuce, Romaine, Spring Mix Agreement obligates Pacific to Indemnify, Defend, Hold Harmless Warranty that all products comply with all laws Guarantee that product not adulterated Maintain GL and Product Liability Insurance naming Wendys as additional named insured. 12 Case Study No. 2 Wendys Suit v. Pacific Filed 8-28-07 No resolution, yet. Parties will argue causation Tough when upstream products co-mingled. 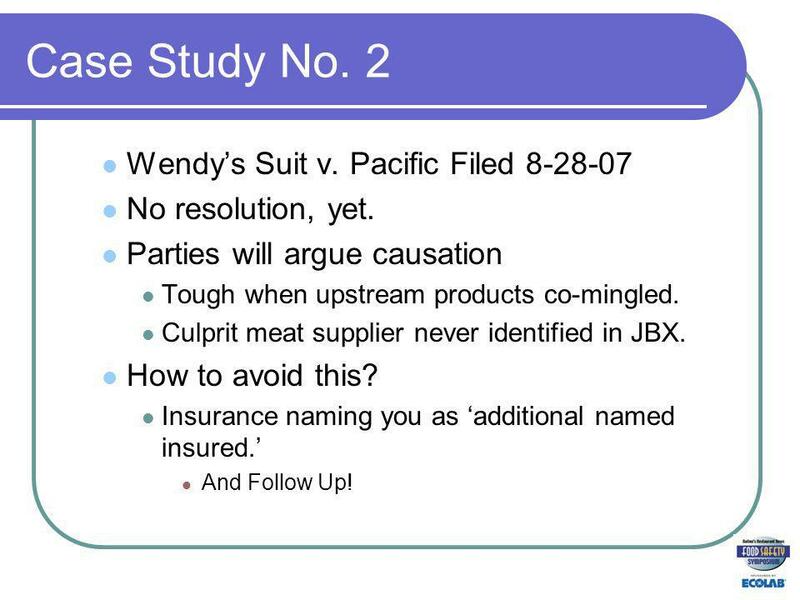 Culprit meat supplier never identified in JBX. How to avoid this? Insurance naming you as additional named insured. And Follow Up! 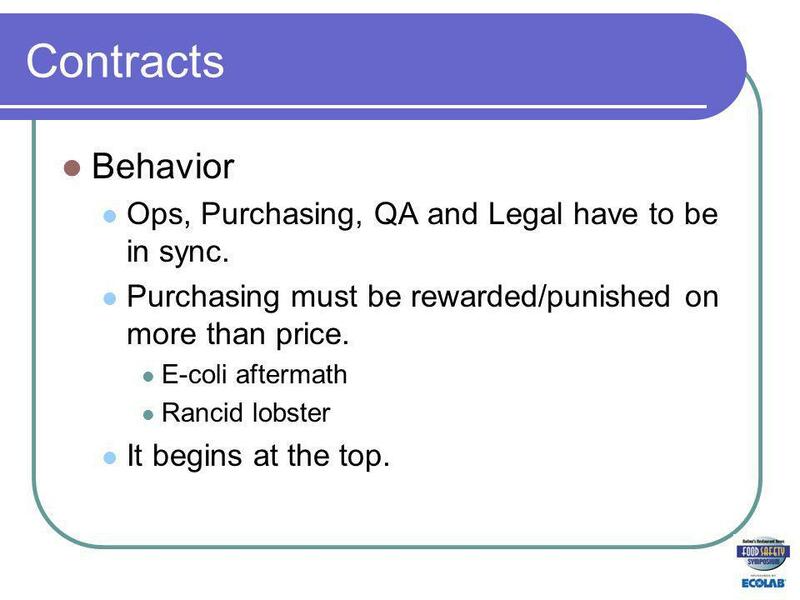 13 Contracts Behavior Ops, Purchasing, QA and Legal have to be in sync. Purchasing must be rewarded/punished on more than price. E-coli aftermath Rancid lobster It begins at the top. 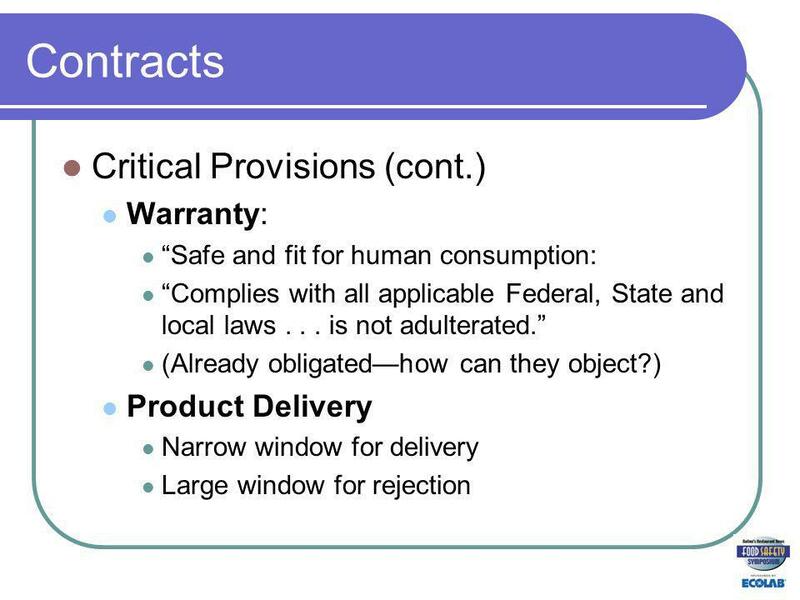 17 Contracts Critical Provisions (cont.) Audit Rights Important in mark-up contracts. 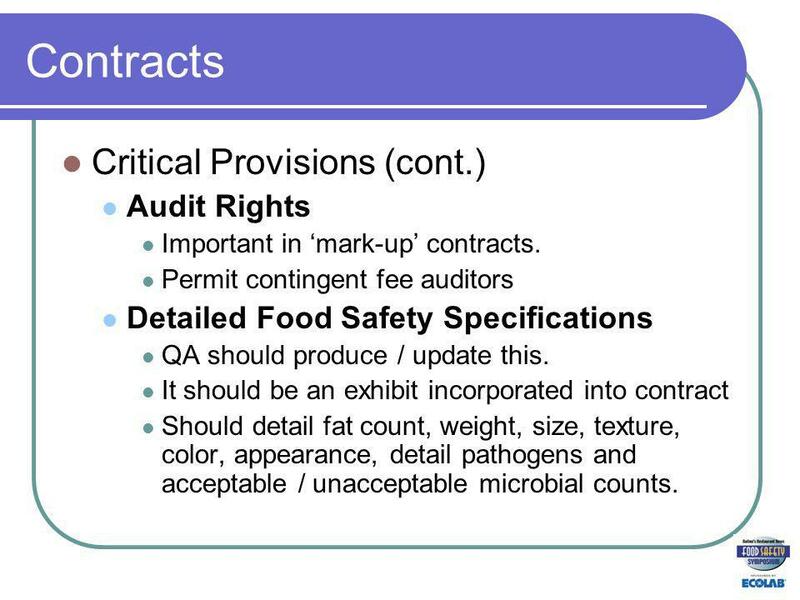 Permit contingent fee auditors Detailed Food Safety Specifications QA should produce / update this. It should be an exhibit incorporated into contract Should detail fat count, weight, size, texture, color, appearance, detail pathogens and acceptable / unacceptable microbial counts. 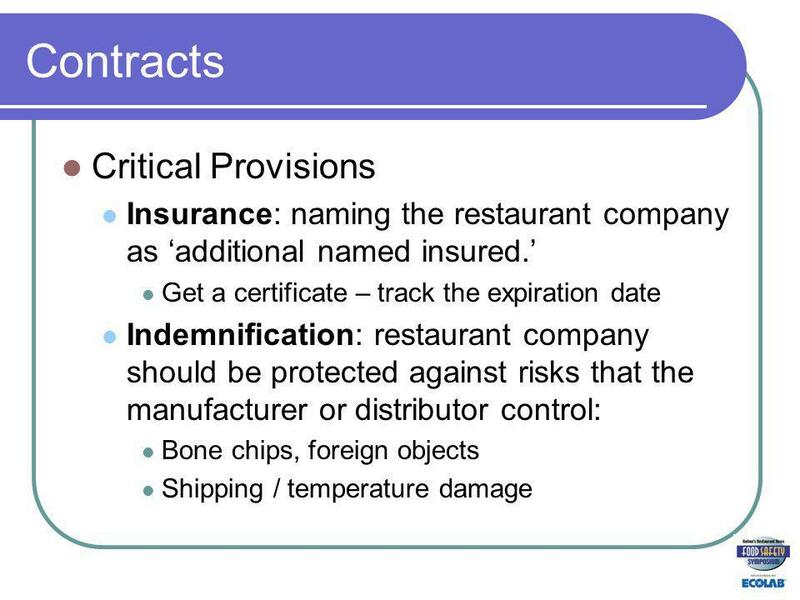 18 Contracts Critical Provisions (cont.) 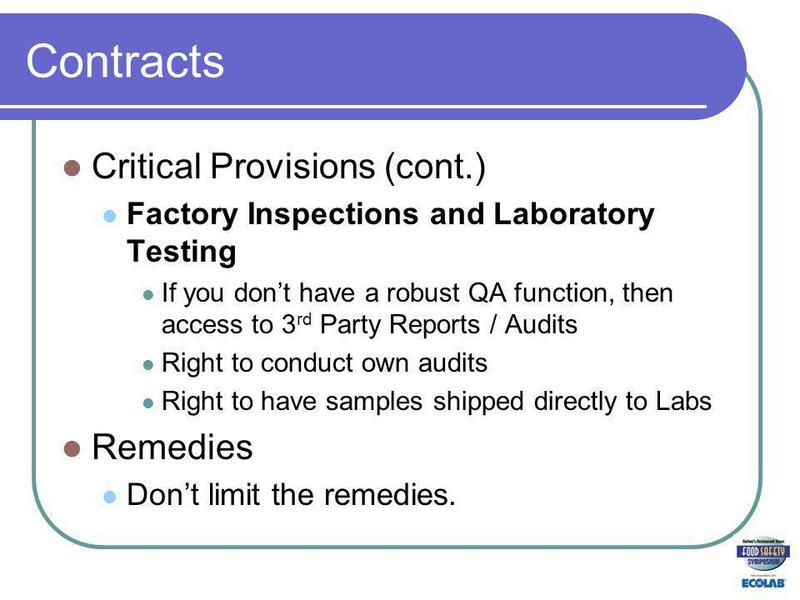 Factory Inspections and Laboratory Testing If you dont have a robust QA function, then access to 3 rd Party Reports / Audits Right to conduct own audits Right to have samples shipped directly to Labs Remedies Dont limit the remedies. 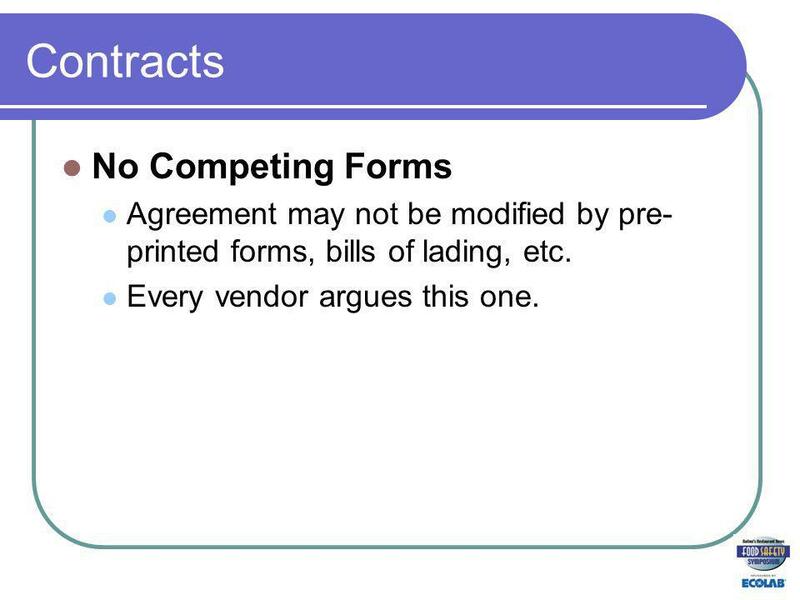 19 Contracts No Competing Forms Agreement may not be modified by pre- printed forms, bills of lading, etc. Every vendor argues this one. 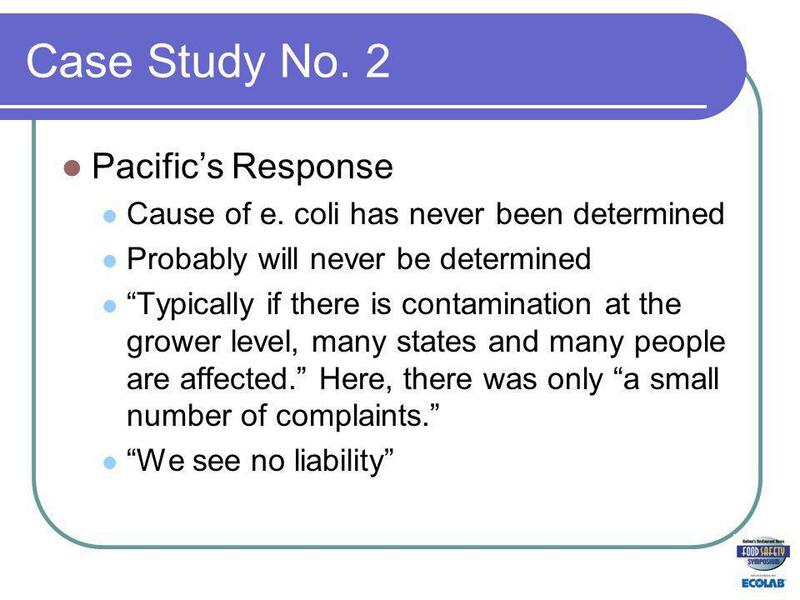 21 Case Study No. 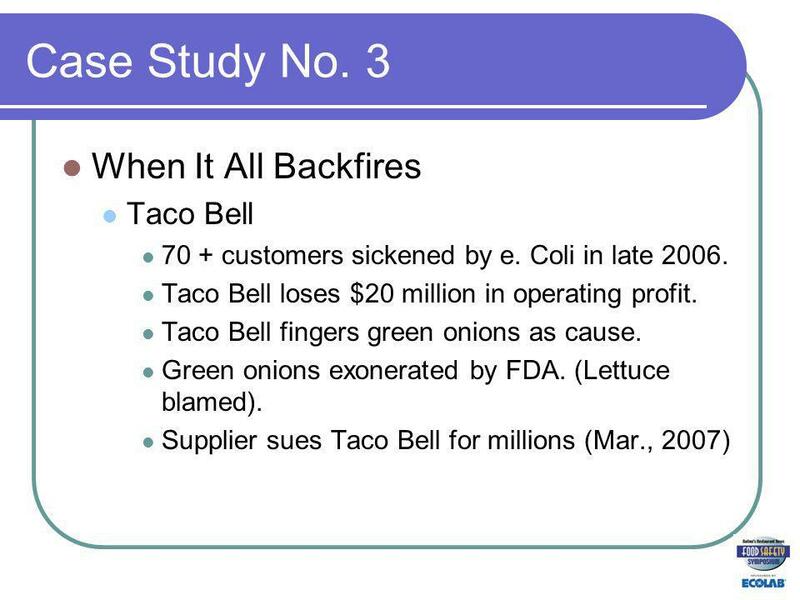 3 When It All Backfires Jack in the Box CEO told media that supplier had provided adulterated product. 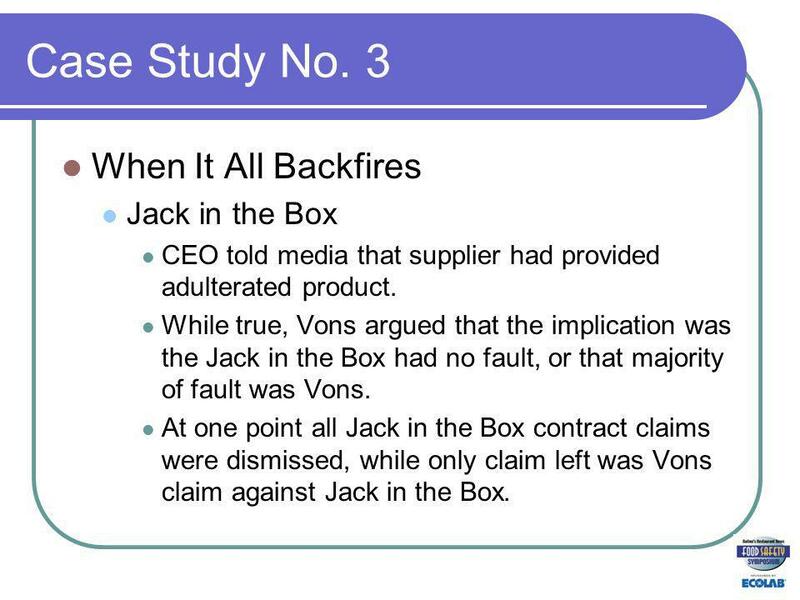 While true, Vons argued that the implication was the Jack in the Box had no fault, or that majority of fault was Vons. At one point all Jack in the Box contract claims were dismissed, while only claim left was Vons claim against Jack in the Box. 23 Case Study No. 3 When It All Backfires. 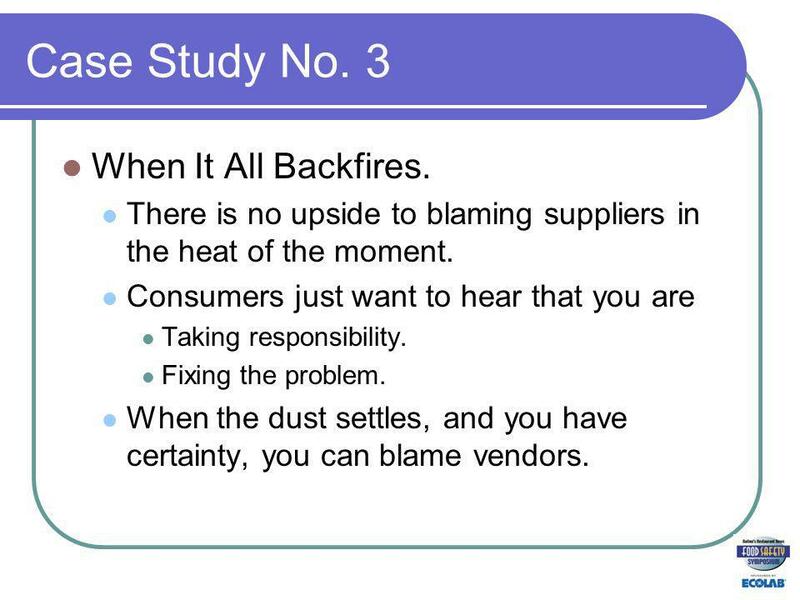 There is no upside to blaming suppliers in the heat of the moment. Consumers just want to hear that you are Taking responsibility. Fixing the problem. When the dust settles, and you have certainty, you can blame vendors. 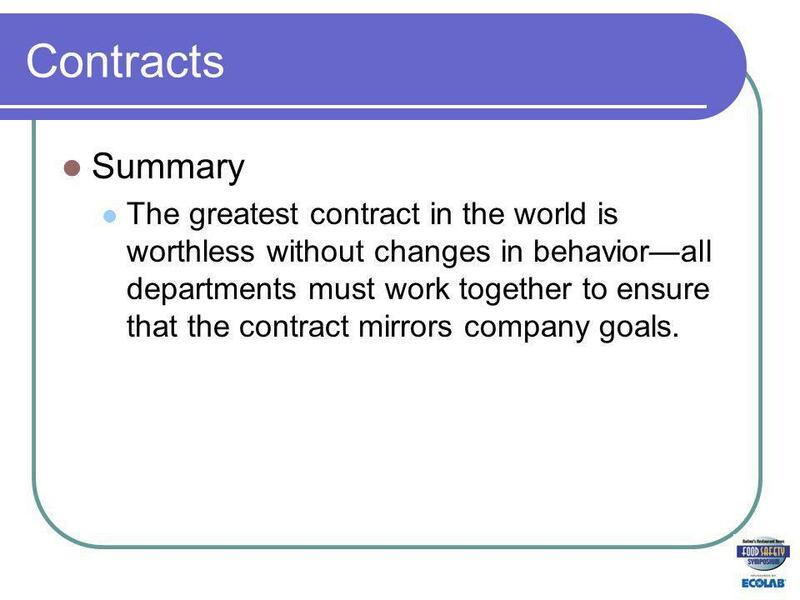 24 Contracts Summary The greatest contract in the world is worthless without changes in behaviorall departments must work together to ensure that the contract mirrors company goals. 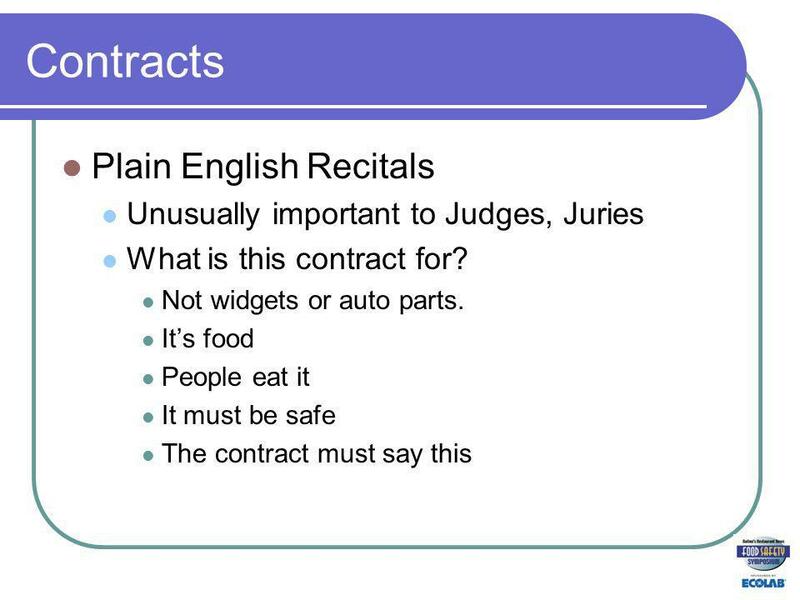 Download ppt "Contracts Purchasing, Manufacturing and Distribution Agreements Case Studies Questions Behavior Plain English Recitals Critical Terms Case Studies." U.S. Civil Litigation – How it Really Works Strict liability –It is your fault – Period! Negligence –Did you act reasonably? Punitive damages –Did you. Contracts for Builders Ross Kinzler, Executive Director. THE ROLE OF INSURANCE REQUIREMENTS WITHIN AN ORGANIZATION By Aaron Hardiman, MBA, ARM. Presented by: Attorney Laurence W. Getman Historical Overview Two or more persons engaged in unlawful enterprise are jointly and severally liable. No. Product Liability – Protect Yourself and Protect Your Business Kenneth Odza, Esq. PROCURING LOCALLY GROWN PRODUCE. Why Choose Locally Grown  Freshness  Holds longer in storage  Shipping costs may be lower  It can help your community. Contract Drafting Class 20 Thurs. Mar. 29 University of Houston Law Center D. C. Toedt III. Supplier Webinar Topic: Legal. ***Sysco Proprietary and Confidential*** 2 Agenda  Required Legal Documents  Additional Agreements Required of Particular. Click your mouse anywhere on the screen to advance the text in each slide. After the starburst appears, click a blue triangle to move to the next slide. © 2006 Prentice Hall Ch THE LEGAL ENVIRONMENT OF BUSINESS A Critical Thinking Approach Fourth Edition Nancy K. Kubasek Bartley A. Brennan M. Neil. Contracts for the Sale of Goods & Warranties Law A.
P A R T P A R T Sales Formation & Terms Product Liability Performance of Sales Contracts Remedies for Breach of Sales Contracts 4 McGraw-Hill/Irwin Business. As a senior at AI, a teacher accuses you of plagiarism and the Dean expels you from school without allowing you a chance to state your case … can you force. Business Law MT-311. 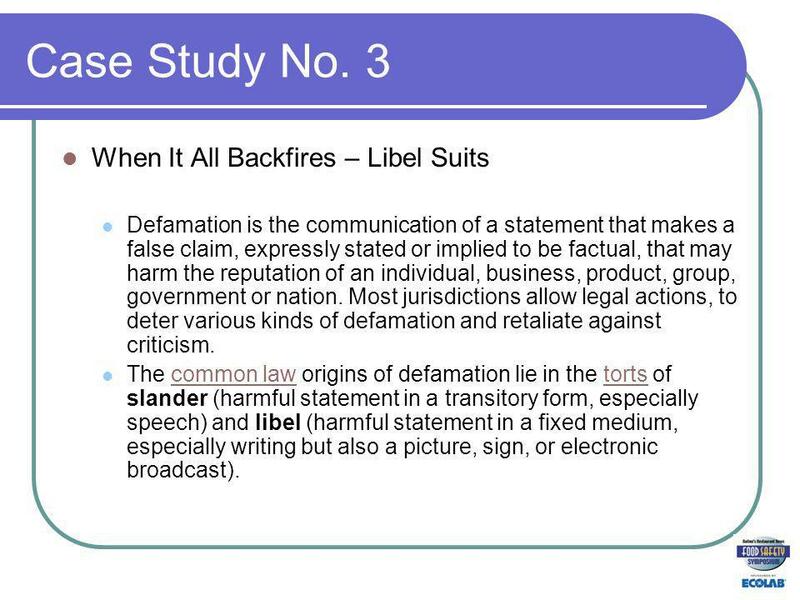  Unit 2 Torts and Cyber Torts  Reading:  Chapter 2, Traditional and Online Dispute Resolution, pp. 33–54 Chapter 4, Intentional.